This dessert just screams fall! Preheat the oven to 350ºF. Grease a Bundt cake pan and set aside. In a medium bowl, stir together the sugar and cinnamon. Add 2/3 of the mixture to a large bowl. Reserve the remaining cinnamon sugar for the apple pecan mixture. Cut each pre-sliced biscuit into 4 pieces and in 3 batches place into the large bowl with the cinnamon sugar mixture and toss until evenly coated. Repeat with remaining pieces of dough. Place the apple chunks and chopped pecans in a medium bowl and add the reserved cinnamon-sugar mixture, tossing to coat. Place half of the biscuit pieces into the Bundt pan, covering the entirety of the bottom of the pan. Layer the apple and pecan mixture on top and finish with the remaining biscuit pieces. Drizzle melted butter evenly on top of the monkey bread. Place the Bundt pan in the oven and bake until golden brown and fluffy, about 50-55 minutes. Remove from the oven and allow to cool for 10 minutes. Turn the Bundt pan over onto a plate and tap the top of the pan to release the monkey bread. For the Maple Glaze: In a medium bowl add the confectioners’ sugar, maple syrup and heavy cream and whisk until smooth. Add more heavy cream if necessary to thin out the glaze. 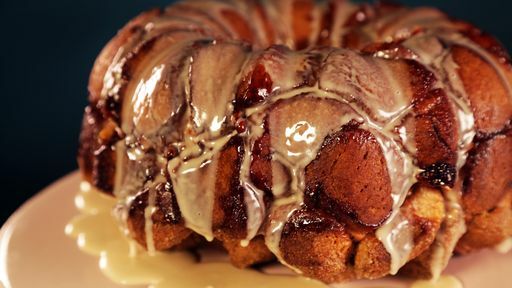 Drizzle the maple glaze evenly over the monkey bread and serve. Tip: For an extra burst of cinnamon flavor, use cinnamon rolls instead of biscuits!